Barra: Don't be afraid and seize the opportunity. NEW YORK (Bloomberg) -- Mary Barra, CEO of General Motors, encouraged women to take on new challenges from studying science and math to accepting jobs that are outside of their area of expertise. "Don't be afraid," Barra said Thursday at a conference in New York organized by Catalyst, a nonprofit organization that aims to expand opportunities for women and business. Women can be particularly reluctant to reach beyond comfortable roles, she said, but they should "seize the opportunity. You'll learn so much." 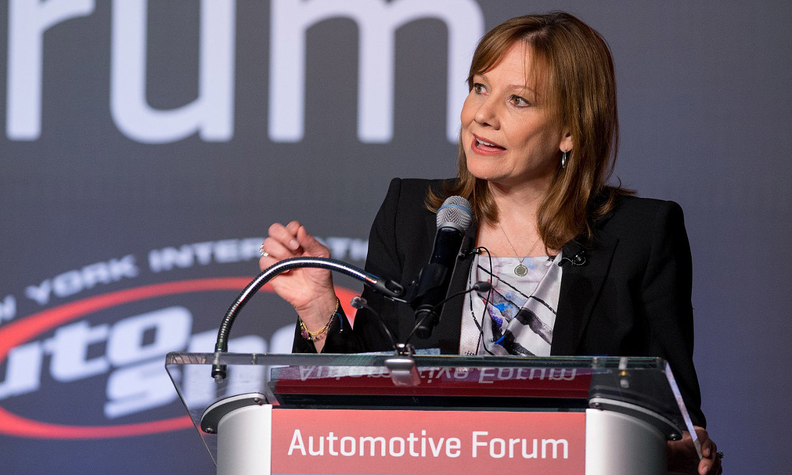 When she took over as CEO of GM in January 2014, Barra became the first woman to lead a global automaker. Within weeks, the company was engulfed in a crisis over its failure for more than a decade to recall small cars equipped with faulty ignition switches. At least 74 deaths have been linked to the flaw, which has prompted a Justice Department investigation and several lawsuits. Barra, 53, has spent her entire career at GM, the largest U.S. automaker. She started as an intern at a Pontiac plant while she was earning a degree in electrical engineering, and the company sent her to Stanford University's Graduate School of Business, where she earned an MBA. Barra has held positions in manufacturing, product development and human resources at the company. In an interview for a new book about her career, "Road to Power: How GM's Mary Barra Shattered the Glass Ceiling," she advised people to be frank with their managers about their career goals. She said she has had many mentors, both male and female, as she rose through the ranks at the automaker.